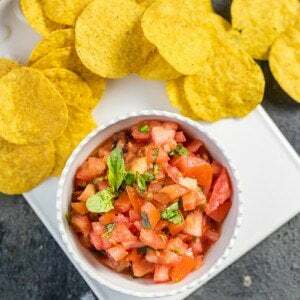 Italian Salsa comes together in no time, using only 5 ingredients! You'll love the flavors in this easy salsa recipe. Perfect as a dip or bruschetta topper. Combine all ingredients (except for the chips) :) in a bowl and stir to combine. Serve with tortilla chips or pita chips. TIP: Chop the tomatoes as finely as possible to make sure that the balsamic and olive oil mix together with the tomatoes fully. If making a bruschetta topping, you can make the tomatoes slightly larger.